The Kama is a simple handle with a blade set at right angles to its length. The blade could be folded up inside the handle and a metal ring which slid along the handle was used to lock the blade into an open or shut position. 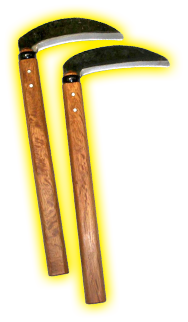 The farmers in Japan extensively employed the Sickle (Kama) as a weapon of combat and these were in a variety of forms. The variations generally being in the length of the handle.